The E-culture publication by Virtueel Platform is available in PDF format. Walled Garden was a 2-day international conference that took place in Amsterdam on 20 and 21 November 2008.
spontaneity and momentum. Is this tendency also affecting the accessibility of information and knowledge? The objective of the Walled Garden conference was to discuss terms of public access to the vast databases of information and to explore a sustainable architecture for the availability of tools and information exchange. In 2007 Virtueel Platform organised Culture 2.0, an international conference and laboratory to introduce Web 2.0-thinking into the creative processes and strategies of cultural institutions. From a practical starting point – in which ways could the developments be applied in the cultural sector? – we investigated whether embracing Web 2.0 tools and thinking would generate new and other forms of content or approaches – or threaten culture as we know it. Now that the tools are in place and people have begun to find their way, the time had come to investigate more specific experiences and challenges surrounding the Web 2.0 hype. What are the success factors and failures of Web 2.0 and can we imagine and initiate new tools and strategies for the future Web? What are the social processes underlying these systems and how does the interplay between new technologies and people’s lives vary according to cultures and institutions in different parts of the world and among different social groups? What are the new inequalities introduced by differential access to infrastructure of wireless communication in a world based on connectivity? Through exploration, experimentation and exchange of knowledge we approached the development and future challenges of the current Web 2.0. Inspiring conversations with a variety of online experts and professionals in the digital field shaped our initial Walled Garden idea. From the very start of the process we set up our own Walled Garden, a semi-closed online environment, which allowed the invited experts to continuously feed back on our initial suggestions and influence the parameters of our working process. Strands and topics for the conference were proposed and shaped by collective conversation. Closer to the conference, we opened up our Walled Garden to the public, inviting participants to observe the process. The conference itself consisted of conversations in the form of structured group dialogue, open plenary sessions, discussions and face-to-face meetings with artists, researchers, theorists and technologists. Tending the Walled Garden (Matt Ratto), Art and Net Ontology (Edward Shanken), Social & Semantic Serendipity (Tapio Mäkelä and Adam Somlai-Fischer), The Network as a Laboratory of New Forms (Bronac Ferran), Relational Intervals (Erin Manning), Future Cultural Organisations (Aymeric Mansoux), and Horizon Projects (Tom Klinkowstein). Participants signed up to one group for the 2-day conference period. In between the intensive sessions, stimulating plenary interceptions came from the second life world There.com (Celia Pearce), included a Twitter treat and dazzling video animation (Mez Breeze), and an insight into gaming as a means to change the world (Claudia Rodriguez). 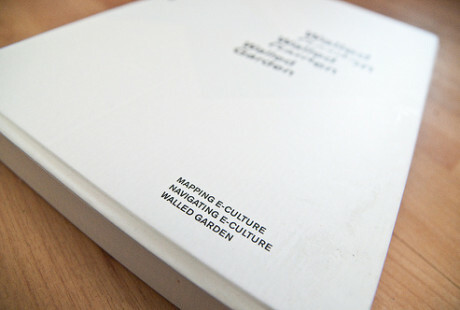 So, what did Walled Garden teach us about the future public garden? and commercial systems. However, currently there is lack of qualitative data, evidence and empirical research regarding the use of Web 2.0 tools. Mapping and data visualisation methods prove valuable in tracing the often still messy boundaries and walls, finding the lay of the land and identifying where innovation can occur. There is a potential role for intermediaries to broker and negotiate in these spaces for knowledge and information exchange . The key challenge is how to regain agency in these spaces and gain more knowledge about what is currently happening. It is crucial to improve and strive for more network literacy and establish rules of engagement. different time zones at will); or Surrogate Selves (taking over decisions for you). Fictionalise what might happen and then experiment to explore these frontiers of science and future: unexpected futures come from unintended events. – Supposing that we have reached a plateau, and what were once innovations have now settled into patterns of informal and familiar use: What future developments are on the horizon, and what are opportunities and challenges? establish ‘agency’ in online environments. To what extent could (media) artists, practitioners, researchers influence next steps? – Under the assumption that we might have already entered a new phase of working, how can we acquire new ways of thinking and become aware (of the implication) of changes? This publication, the articles together with reporters’ notes, quotes, photos, and complemented by our online Walled Garden should be seen as seeds for thought and future gardens. While the exploration has started, it’s still a long road towards implementation. Thanks to our fellow gardeners – moderators, presenters, reporters and participants without whom the garden will not flourish. As a concrete example, the ‘Leaky Garden’ tool (www.leakygarden.net/), which was developed during Walled Garden, shows which ‘walled gardens’ leak, and which are watertight. Social network sites and other Web 2.0 services with usernames and logins are analysed by the amount of indexed items in Google. How often have the usernames from the 2.0 sites been indexed by Google? Leaky Garden shows the quantity of leaks per 2.0 service.